Charmy Bee is a hyper, six-year old bee and a character from the Sonic the Hedgehog series. He is a member of Team Chaotix, along with Espio the Chameleon and Vector the Crocodile. He appears as the second Sonic referee in Mario & Sonic at the Olympic Games, after Cream the Rabbit. He reappears as a referee in Mario & Sonic at the Olympic Winter Games, and drops the puck in the Ice Hockey event during the Face Off. He also appears in the Adventure Tour of the DS version. In it, the other members of Team Chaotix left him behind in Cubyrinth while they were traveling. He will not open the gates he is in front of unless the player finds Vector and brings him to Charmy. Charmy will then argue with Vector and he will start a quiz. If the player completes the quiz, Charmy will cheer and open the gates. If the player talks to him enough times, he will tell the player the number of whitestones on Dream Island. 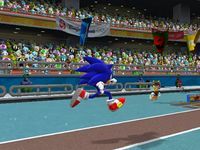 Charmy Bee reprises his role as a referee in Mario & Sonic at the London 2012 Olympic Games. Charmy once again appears as a referee in both versions of Mario & Sonic at the Rio 2016 Olympic Games. In the Wii U version, the player needs to talk to him to play Legends Showdown mode in single player (to play it in multiplayer, the player has to talk to Birdo instead). In Super Smash Bros. Brawl, Charmy appears as a sticker, and also appears in Super Smash Bros. for Nintendo 3DS as a trophy. In Super Smash Bros. Ultimate, Charmy Bee appears as a spirit alongside Vector and Espio. Charmy brings a positive attitude to the Chaotix Detective Agency. To him, work is a blast! He's still a kid, though, and he has a lot to learn. His energetic nature can also annoy Vector. He's been keeping himself busy as a bee ever since he first showed up in Knuckles' Chaotix. This page was last edited on February 9, 2019, at 20:07.